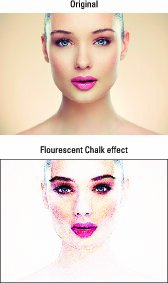 In addition to the multitude of filters at your disposal, Elements 15 provides a lot of effects that you can apply to enhance your photos, such as the Fluorescent Chalk effect. Note: Some effects automatically create a duplicate of the selected layer, whereas other effects can work only on flattened images. Choose Window→Effects or click the Effects icon in the bottom right of the workspace. With each release, Adobe adds a few interesting effects. In Elements 15, you have Effect Collage and Painterly under Fun Edits. This version also gives you Photo Text and Speed Pan under Fun Edits and Frame Creator under Special Edits. All the effects in Guided mode are very user friendly (hence, the name). Simply click your desired effect and follow the detailed steps delineated in the panel on the right of the workspace. Elements 15 brings the new Effect Collage (left) and Painterly (right) effects.